What should the online giving experience look like? What giving technologies are most efficient and effective? How can my church afford to employ new giving technologies? How do we reach every generation of givers in the church? Do these questions resonate with you? I bet as a church leader you’ve asked something along these lines at some point in time because you know the importance of generosity in the church. I’m happy to provide you the answers to these questions today! 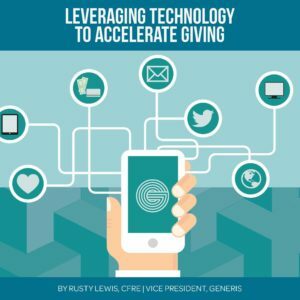 It’s all in my newest resource, an e-book titled “Leveraging Technology to Accelerate Giving.” And this 37-page e-book is available to you today for free! Here’s a sneak peek into the book… the chapter on Millennials and technology. The common perception that young adults love their smartphones has become a statistical fact. This information alone is a strong case for e-giving. So I encourage you to download your free copy today. This is one thing you can address to accelerate generosity for years to come.